What is your love style? We all turn into completely different people when we fall in love. And, believe it or not, our general love pattern doesn't really change. It makes our love life either incredibly happy or utterly miserable. 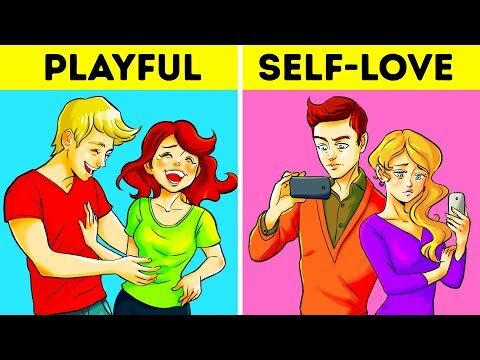 Are you an example of the unhealthy self-love pattern? Or are you all about obsessive love? Or maybe you're big on playful love? This quick test will show how your love style affects your romantic life. Your job is to answer the questions honestly and keep track of the letters you choose. At the end, your most frequently used letter will reveal exactly how you love. - If the majority of your answers are As, you're a living example of the unhealthy self-love pattern. To put it simply, you mostly love yourself, the way you love somebody, and their love for you in a relationship. At this point, you're not ready to give somebody your time without receiving anything in return — you have to be praised and admired. - If you're a fan of the B answers, you're all about obsessive love. As you can probably guess, that’s no good either. You need validation in your relationships, and you are prepared to go far to get it. Moreover, you have a hard time trusting your partner, which is why you can be possessive, jealous, and codependent. Of course, no relationship can survive this poisonous environment for long, so you rarely develop a long-lasting bond with somebody. - If the answers under the letter C were your go-to options, you're big on playful love. There's nothing you enjoy more than new adventures, experiences, and memories, and that's exactly what you expect from a relationship. The classic rom-com scenario of 2 people playfully hating and teasing each other until they fall in love is your idea of a happy relationship. - If your answers mostly consist of Ds, realistic love is your everything. You behave incredibly maturely in love and know exactly when you need to be patient and tolerant. You're a person of action, and strong declarations of love don't really impress you — it's your partner's behavior that truly counts. Nonetheless, even an outstanding partner like you has certain issues in relationships, and the main one is seriousness. - If you chose answer E the most, congratulations! You’re one of the rare examples of people with the selfless love pattern. This love style is considered to be the highest form of love! You're not one to have tons of crushes; you fall in love hard and are always ready to give your partner everything without asking for anything back. Your relationships aren't about you or your partner; they're about unity, connection, and being a team. Why did I watch this vid... I am confused... Well I’m staying single. E was my result. Very much satisfied. Please add videos like a story!its a requet! I'm D. I really do care about bonding, but I also had some E's in there. I would really care about them and do anything in my power to make them happy. I want to have a strong, strong, connection and understadning of them. Yes i have E the most! problem these are my answers d=2 a=1 b=2 e=2 c=1 what's my result? I think its true...I never been in love...and I dont have any crush accept some celebrity😒 And yeah...I actually think I am team E...all of my answer was E.